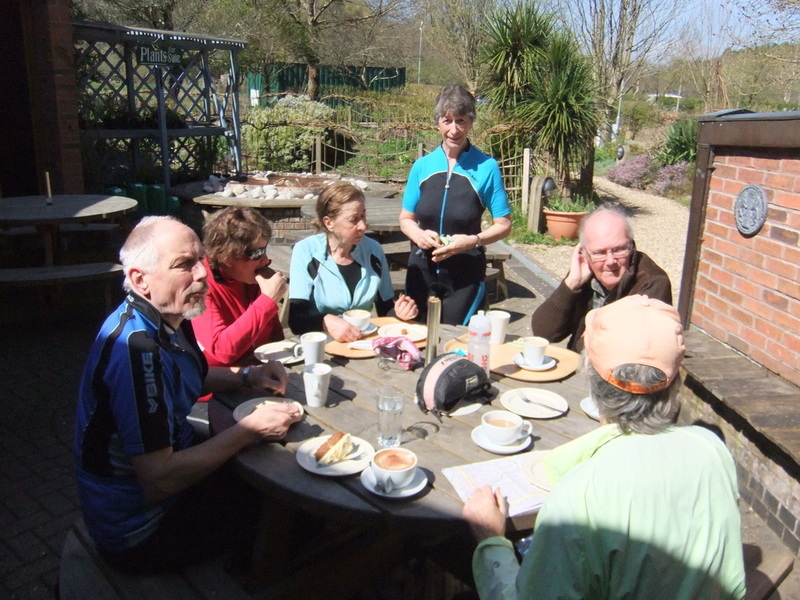 Following Tuesday Cycling's successful 2011 and 2012 short tours we decided for 2013 to revert to starting from and finishing at our home base in Lymington. With the sea to the south and our first tour traveling north, it was time to head west into Dorset, Somerset and Wiltshire. Ringwood, Gussage All Saints, East Stour, Wincanton, Wheathill, Axbridge, Wells, Nunney, Mere, Shaftesbury, Broad Chalke, North Gorley and at the top of various hills. She provided detailed route sheets and negotiated an assortment of accommodation and feeding bookings. 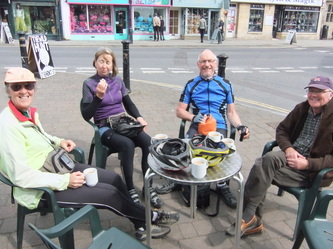 Mary, John and Sheila (with Bev and Keith) cycled 100km around the Forest on the previous Sunday and survived; Rosemary and Johnathan managed a few regular Tuesday runs on their tandem; and Judy kept her training schedule a closely guarded secret, but went on a course on the weekend before the tour start to be trained as the team bike mechanic. 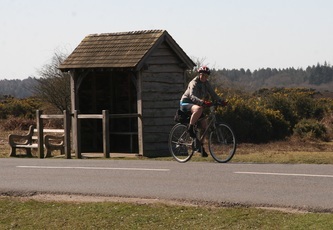 Home territory, a lot of this, as we wend our way via Ringwood and Cranborne to East Stour in the Blackmore Vale. The name Gussage All Saints refers to the gushing stream that rises at Gussage St Andrew and eventually flows into the River Allen. 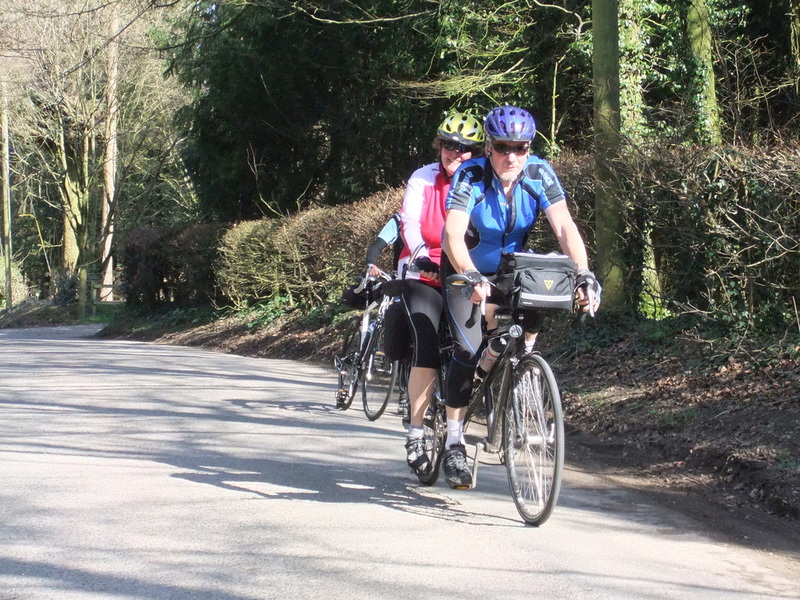 The route uses part of the North Dorset cycle route from Gussage All Saints to Fontmell Magna and continues on Sustrans route 25 to East Stour. There are hills. 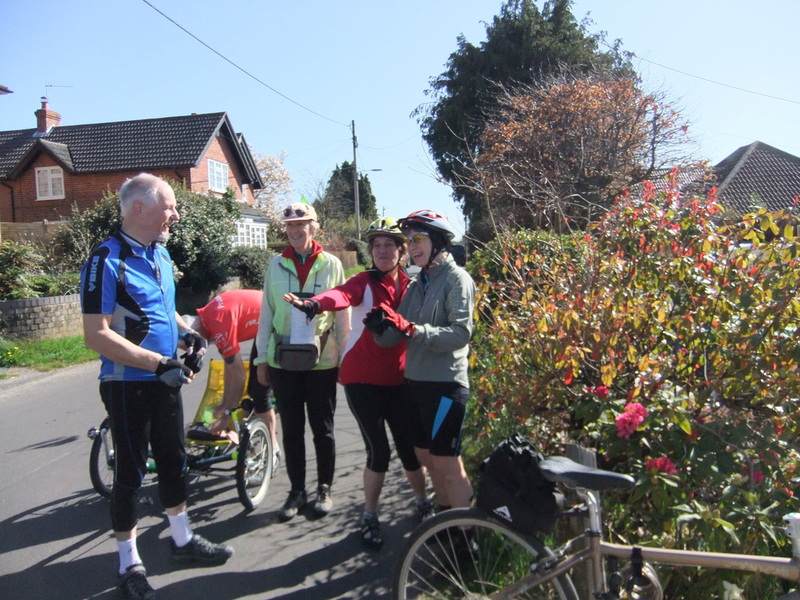 We almost left Lymington, but Mary having a forgetful morning discovered she was minus her wristwatch, so paused to give Mike directions for going back for it. Not sure whether it was a super heart rate, stop watch fully sportive type of watch, or just one that confirmed that you were correct in feeling it was coffee o’clock. 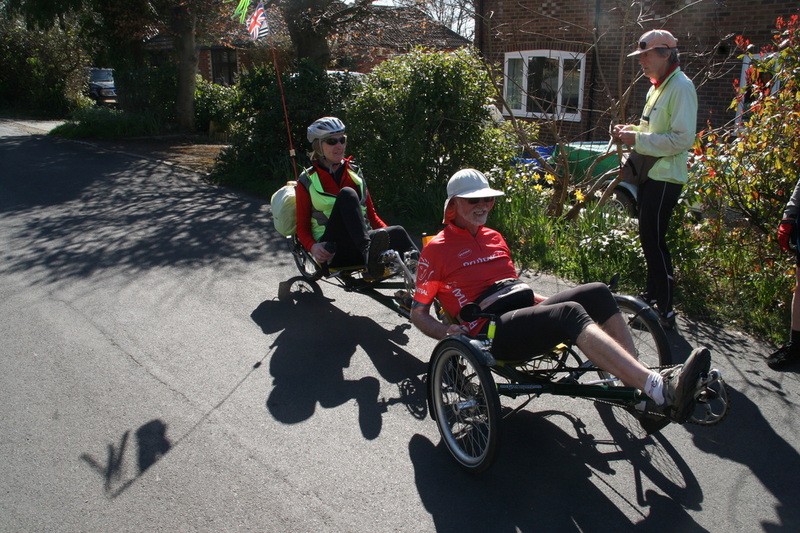 On the second attempt we left Lymington Town Hall on a Tuesday morning on the hottest day of the year so far and collected Jonathan and Rosemary en route in Sway. Mike took the official complete tour group start photo. Steve had come to see us off and tagged along to Sway too, then decided to carry on with us to our Ringwood coffee stop. 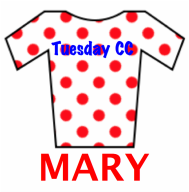 Having crested the insignificant hill before Burley that Mary has psychological trouble with she then shot off at high speed into the village ignoring our route past the White Buck. 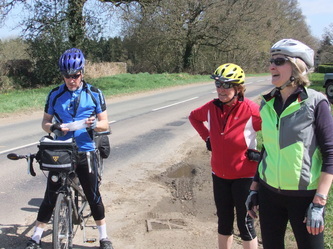 Jonathan explained that she really was having a forgetful morning and had no drinks bottle, but had reassured him that having purchased one she would meet us again on the Crow Road. Re-united at the Crow Road turn we continued without further alarms and under cloudless skies followed familiar Forest roads to the Busy Bee café at the Lantern Centre just beyond Ringwood. First cake choice dilemma of the tour, but great to be able to sit outdoors in the warm deciding whether to do sun or shade while drinking our coffees. Seduced by the sunshine and the urge to travel on, Steve phoned David to broach the subject of a later car retrieval and then just kept going. The count of Brimstone butterflies increased satisfactorily as we continued, confirming that Spring had at last arrived; and by the time we were approaching Cranborne on the Alderholt road even Judy admitted she was “getting hot”. 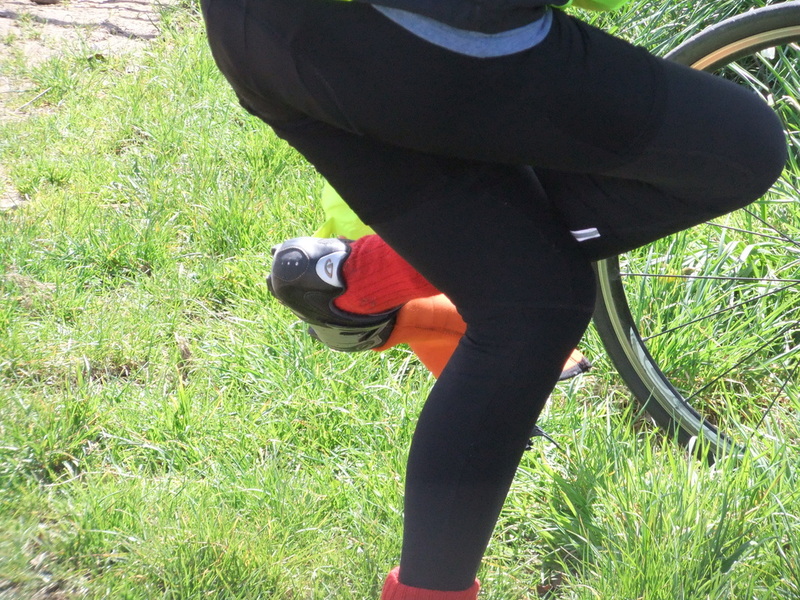 A short stop allowed her to remove her scuba diving footwear and several layers of clothing. 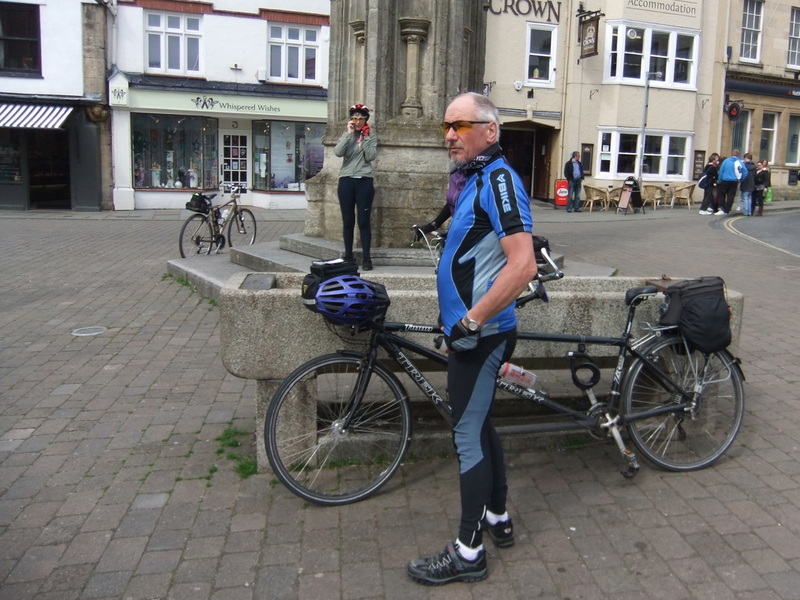 We passed through Cranborne, agreeing it was too early for lunch and so on through pretty Wimborne St Giles to ‘The Drovers’ at Gussage All Saints, where we sat under sunshades in the garden to enjoy a very leisurely lunch. Steve had now reached the point where cycling home was further than continuing with us and continued phone negotiations with David about her return to Lymington. 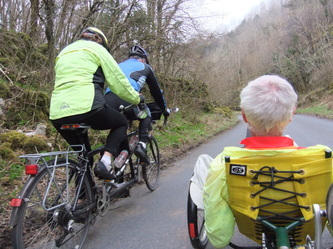 We all pedalled on, now over unfamiliar roads after lunch. 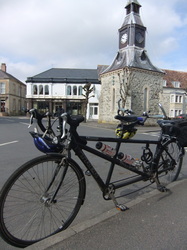 The Dorset hills began in earnest as we rode over the western end of Cranborne Chase and through Ashmore. After a long swoop down there was an inevitable ascent with Fontmell Magna being preceded by Fontmell Hill, our first serious climb of the tour. Low gears all round. 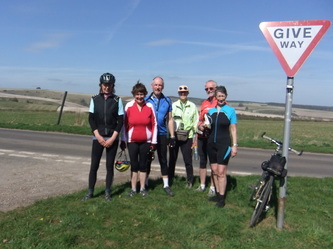 A short stop on the top of the downs allowed for the long views and sounds of skylarks above us to be appreciated, together with a group photo to show we had now reached foreign lands. 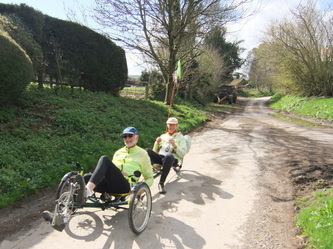 Bedchester and Margaret Marsh followed and a final hill brought us up from Stour Row to East Stour Common and the King’s Arms pub, where some of us were to stay. The rest of us were in a charming cottage B&B just down the lane. Steve waited in the garden in evening sun while we washed and changed and all met at the pub for an excellent dinner. 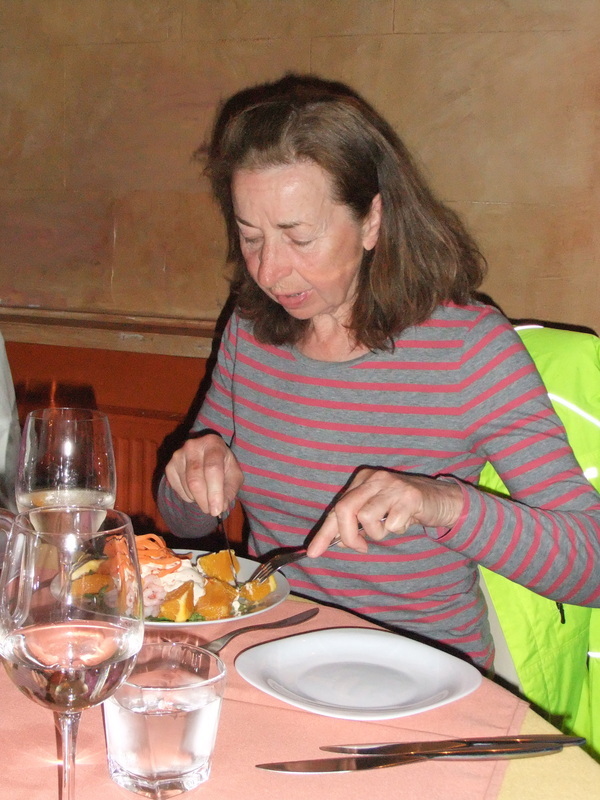 Sea bass special for some of us and, naming no names, fruit crumble and other puddings for some followed by a short chat with the chef on how to excel at crumble making. 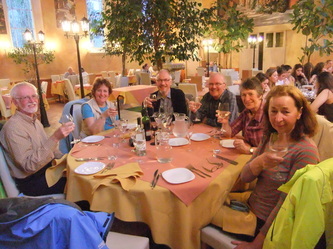 Oh and by the way David did join us for dinner and then took Steve and bicycle home. Start on Sustrans route 25. Elegant Georgian houses and coaching inns record Wincanton's importance as a staging post on the main London to Plymouth road. In the 1600s the town provided stabling for nearly 300 horses. 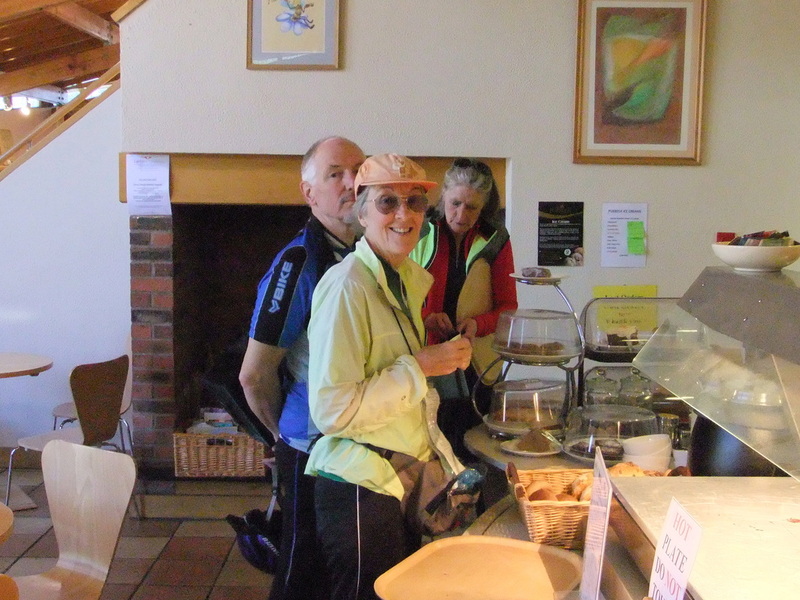 The route uses Sustrans route 26 from South Cadbury, where we pass close to Cadbury Castle. Route 26 uses an underpass to cross the A303 from Sparkford. Views of Glastonbury Tor as we approach the town. After Glastonbury we cycle over a corner of the Somerset Levels. 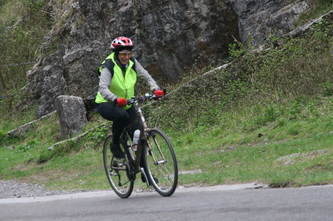 Option to use a short part of the Strawberry Line cycle path from south of Cheddar to Axbridge. A greyer day dawned on Wednesday with low mist cutting out all the view from our B&B. Satisfactory breakfasts at both overnight venues. The party set off in good spirits (nursing some sunburn) for a short main road whiz downhill, then off into quiet lanes again, including Witch Lane and Folly Lane – did Sheila choose them for the route or their names? 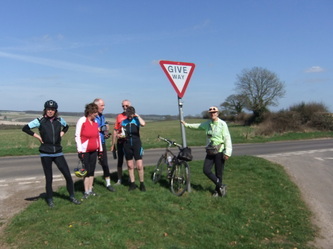 We dropped down to cross the River Stour and then under the railway where there was a moment of route finding indecision. 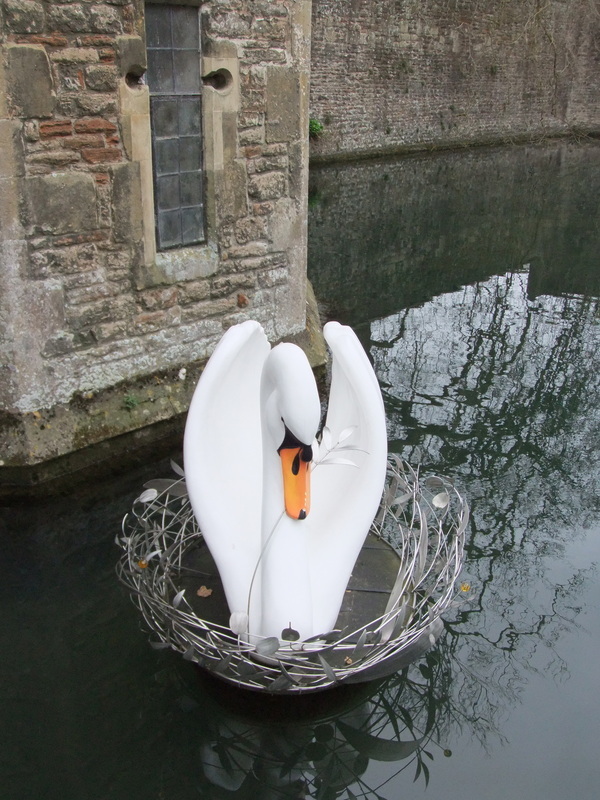 Sheila said her instructions said left and the GPS said right, so chose right. 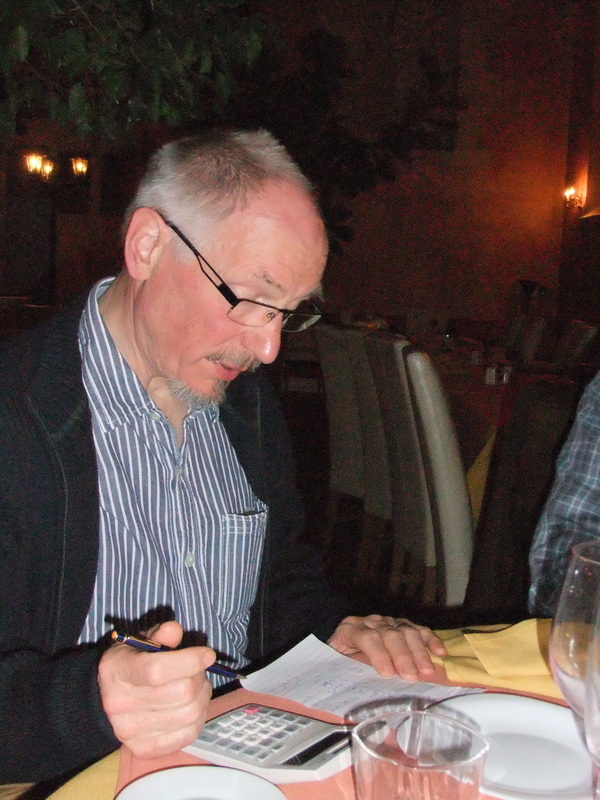 Having had this queried by Jonathan she increased the GPS map scale and agreed all navigation aids now “said left”. 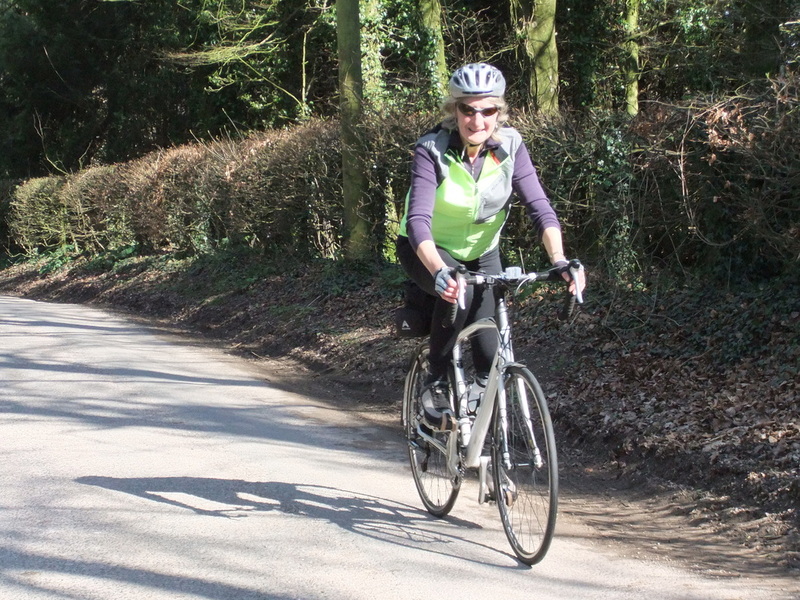 Onward on our rural ride in small lanes, generally in good condition, but some with debris and grass in the centre proved to be a bit challenging, not to say bumpy, for Gertie Greenspeed. One short sharp climb brought us out onto a balcony lane with land falling away on our left to reveal long views out to the west. 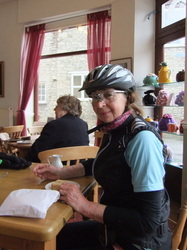 A short climb over the A303 brought us uphill to reach the Café Central in Wincanton for our morning coffee stop. 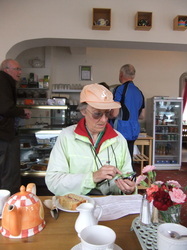 The café specialised in spots – spotty mugs, spotty plates and spotty décor. The exit westwards began rather boringly on urban roads through Wincanton roundabouts and a short stretch on the A371, but soon we turned left, dived under the A303 and were back in the country and passing banks solid with primroses. 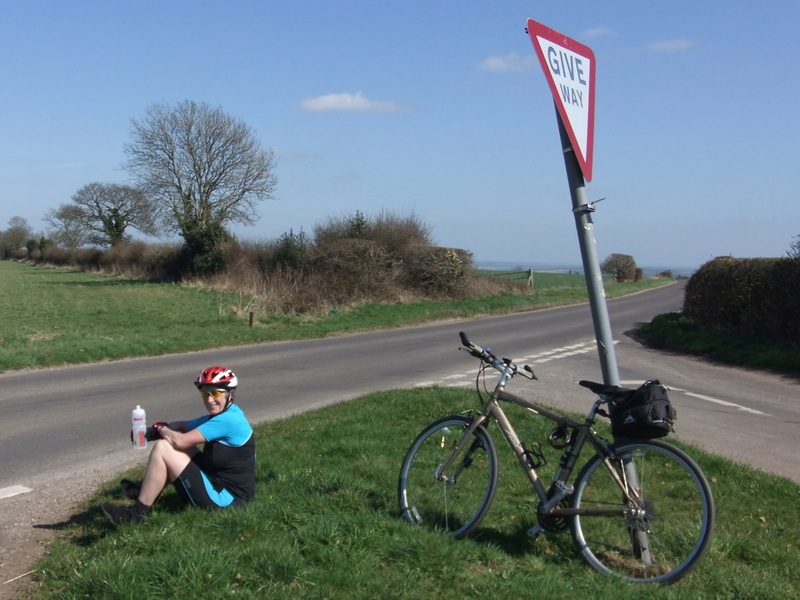 A mixture of former main road (now downgraded and replaced by the new A303) and lanes took us up and down through pretty villages towards Cadbury Castle and Camelot. The Cadbury Castle earthworks were spotted and we also had our first glimpse of Glastonbury Tor in the distance. More lanes and a final underpass of the A303 took us north to arrived at Wheathill Golf Club for an excellent lunch produced at lightning speed. Judy managed to combine a light lunch with a little light shopping from the bargain clothing rail. 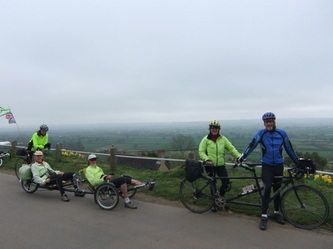 After passing a field improbably housing two zebras, we followed a delightful motor-free road for the last few miles approaching Glastonbury with the Tor drawing closer and closer. Up a stiff little hill and we dropped down into the town centre for tea (and for Rosemary ice cream) outside Heaphy’s Café. 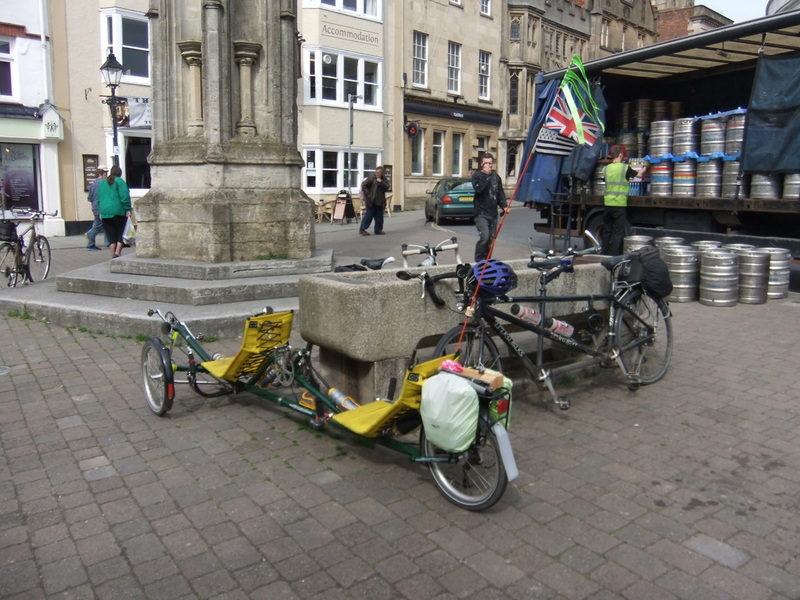 The town’s now slighted faded hippy character and somewhat ageing hippy characters provided a distraction. Judy declared that she had come over all “Home Counties” – believed to be an allergic reaction to the Glastonbury ambience; Mary had a shopping success, finding a book with everything you need to know for fairy-themed parties; and Sheila was engaged in some intensive technical discussions with unemployed Glastonbury locals regarding recumbent tandem trikes. 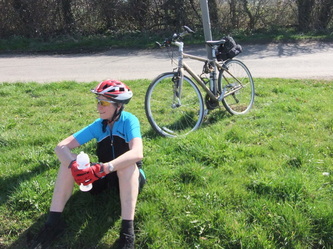 Then we cycled in sunshine along the droves that led from Glastonbury to take us beside drainage ditches lined with willow across the north-east corner of the Somerset Levels, which, as they should be, were satisfactorily very flat, before joining B roads towards our destination at Axbridge. John and Sheila’s trike suffered the only puncture of the trip here. All but the trike used a short portion of the Strawberry Line cycle path for their final approach and we met up at the B&Bs. Feeling pleased to have had another day of cycling in dry weather, even if slightly dull at times, John was slightly surprised shortly after entering our Motel bedroom to find that his socks were quite sodden. Apparently the carpets had been cleaned that day and were still sopping wet. After this we made sure not to put anything on the floor and not to walk around without shoes – a bit like camping. 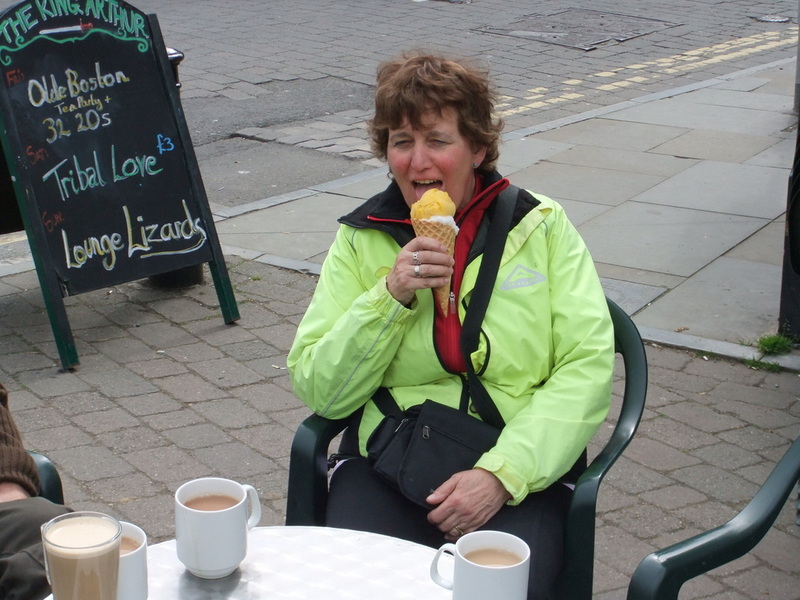 Later we walked into the historic centre of Axbridge for a substantial supper at ‘The Lamb’. Sea bass was once again on the specials board. A short run to Cheddar. At almost 400 feet deep and three miles long, Cheddar Gorge is England’s largest gorge, and with its weathered crags and pinnacles, one of our most spectacular natural sights. The gorge would have begun forming about one million years ago during the last Ice Age when water from melting glaciers formed a river, which over time started to carve into the limestone rock creating the steep cliffs you see today. 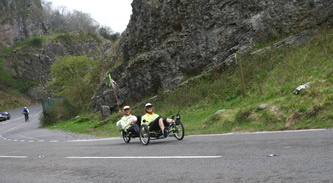 The Cheddar Yeo River gradually made its way underground, creating the famous Cheddar Caves. 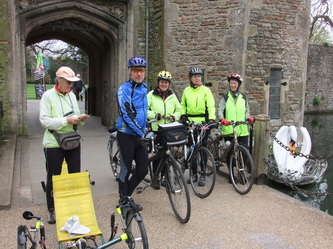 Ascending Cheddar Gorge to the top of the Mendips we then descend to Wells with its 13th century cathedral and Bishops Palace. 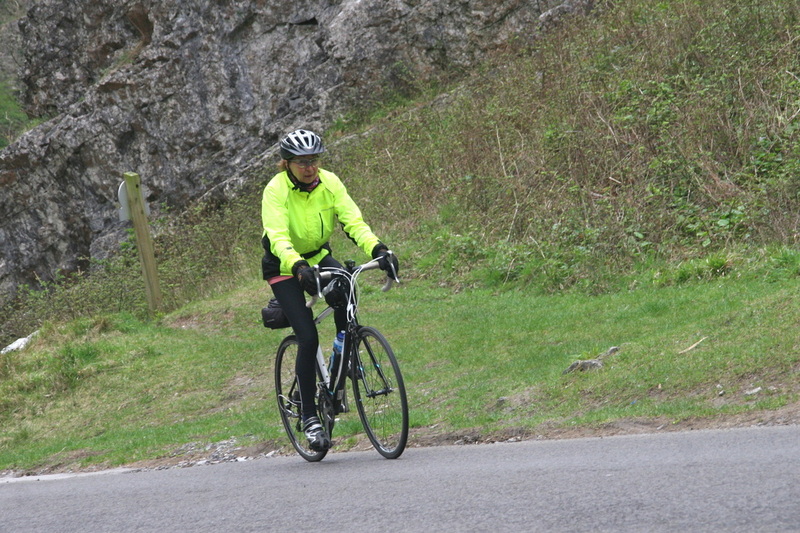 We then climb again to regain the tops of the Mendip Hills. Later we pass close to Stourhead Gardens and House, but after Nunney also take on another challenging climb up Gare Hill before reaching Mere. 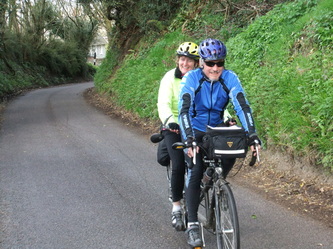 Finally we climb the hill before the hill up to Shaftesbury followed closely by the hill up to Shaftesbury on the edge of the Blackmore Vale, a small market town famous for the ‘Hovis hill’, Gold Hill. The party was a little subdued when we first met up on Thursday morning, facing the ascent of Cheddar Gorge. 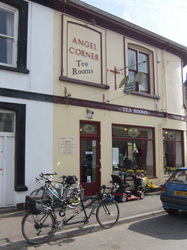 In no time at all we were along the B road to Cheddar and through the tourist shops below the gorge. Unfortunately John was suffering from a severe attack of upset stomach this morning so the other four set off into the gaping mouth of the rocky cleft and the tandem trike followed up as far as the car park with Mike and the team car in order to stop for medication. After downing the pills and a short discussion they were declared not to contain any banned substances so we were free to continue. Not a lot of choice anyway really. Suitably awed by the towering cliffs on either side the trike climbed on to catch Jonathan and Rosemary on their tandem and then continued to climb together with them. Plenty of goats to spot on the way. 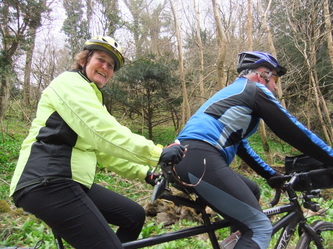 In an attempt at self-distraction John tried his hand at action photography, steering with one hand alongside Jonathan and Rosemary while attempting various hill climbing photos of them until Sheila confiscated the camera and gave instructions to get back on the correct side of the road and concentrate on pedalling. Rather disappointingly in the run out at the top as the gradient eased we passed the 2km to finish line and then the 1km to finish line, but could not find any trace of an official “finish”. Reunited on the top of the Mendips everyone confirmed that it had all been very capital S Scenic, but a bit over-hyped for mountain category and was actually easy-peasy. John kept silent about what else was to come today in the climbing department. In a short distance we turned right and descended at breakneck speed for several kms giving up all of our gained altitude to reach Wells. A bit of tricky, but well executed, navigation by Sheila threaded us through the one-way maze of Wells and into the Bishops Palace grounds for coffee in the Bishop’s Palace café. 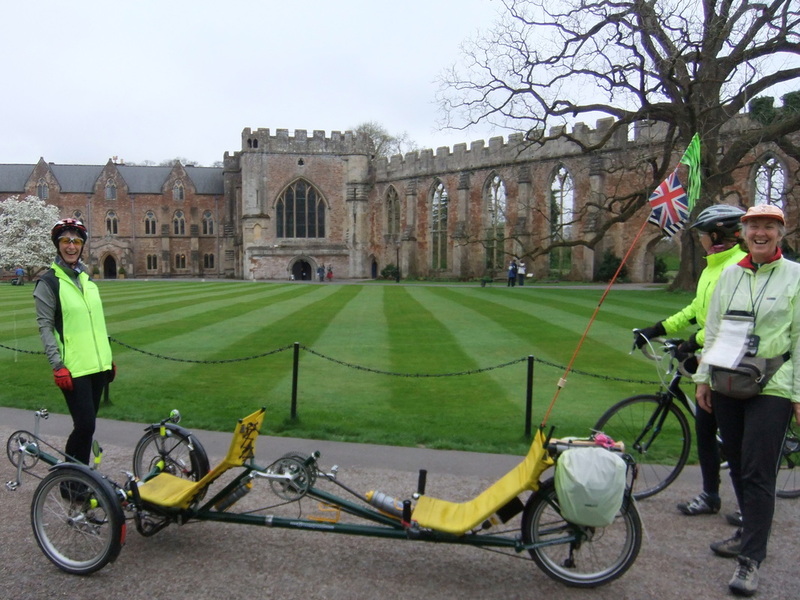 The immaculate mown stripes on the lawn in front of the Palace called for a special photo (stripe & trike). The café and the toilets were both new and of a very high standard. 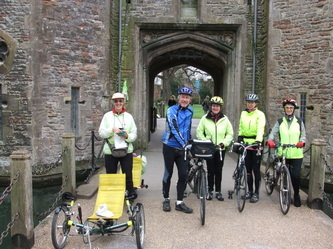 A few group photos followed on the drawbridge and one of Mary posing beside Guinevere (see photos). Clambering up and down the side of the Mendips again eventually we were once more on top of that great limestone block. 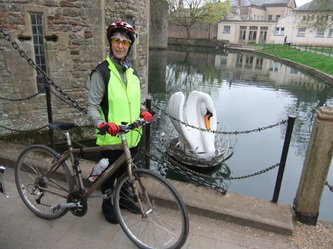 After various undulations we were becoming slightly nervous that we would be late for our lunch appointment in Nunney so sent Mike on to recce a possible intervening opportunity in Leigh on Mendip. However as we rolled through Leigh Mike signaled from the roadside that food was off (in fact the whole pub looked a bit “off”) so without a pause we upped the pace for the next seven kms and finally shot down and up another tricky narrow lane to Nunney. 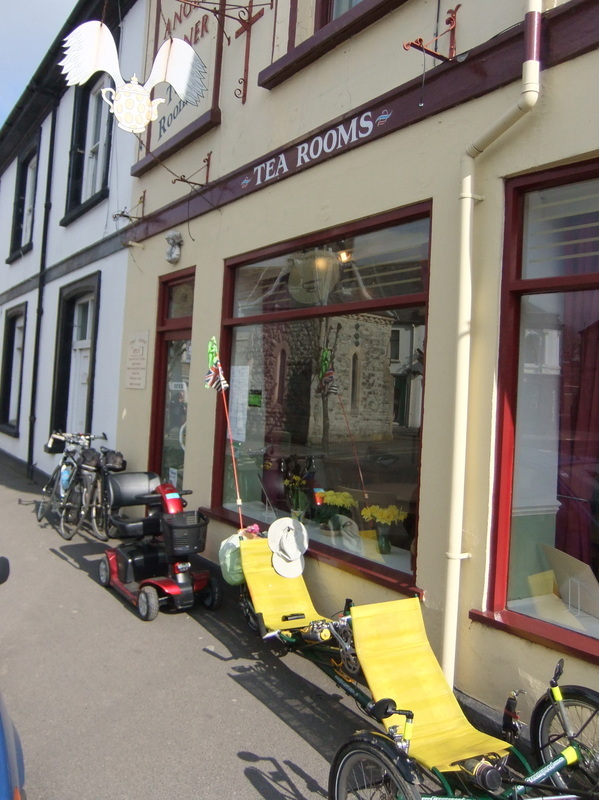 Apart from the car park behind the George being seriously uphill, it was a great stop and an excellent lunch was had by all sprawled on their comfy seats (or for some of us comfy seats plus extra comfy cushions). Well-fortified we took to the road again in good spirits. 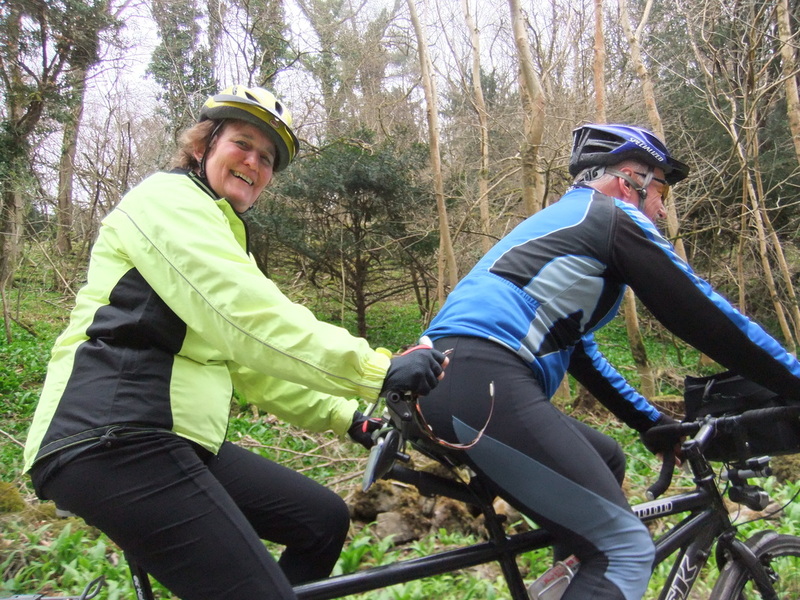 At first the cycling was easy as we dropped down into and across the River Frome valley. There were splendid long views towards a large range of hills and away to our left you could just see a church perched right on the skyline. 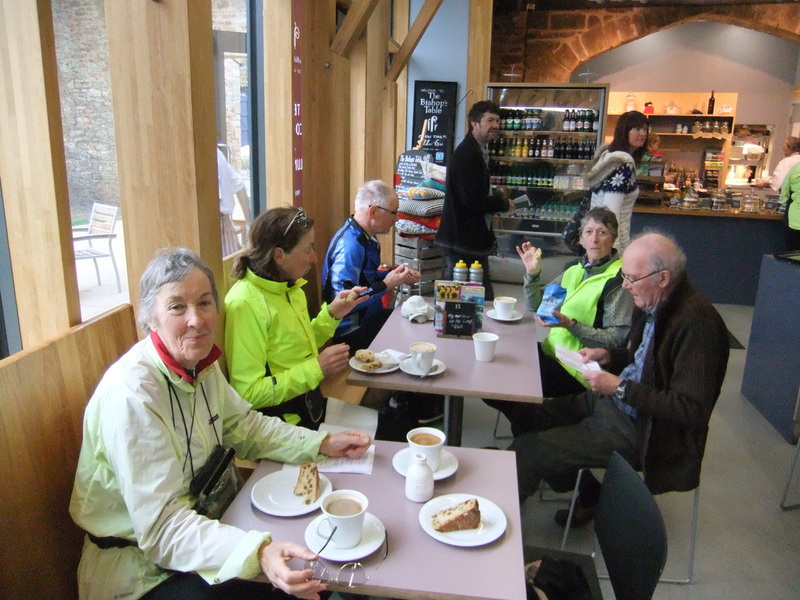 John and Sheila looked with fond memory at it, but decided nothing would be gained by prematurely breaking the news to all that this church was on our route and was to be gained via the legendary Gare Hill. Inevitably as we drew closer this became evident to all. 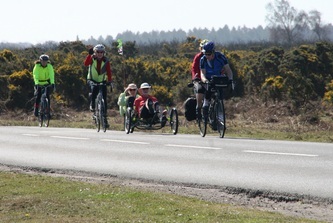 Judy and Mary were sent on as the advance guard while Jonathan decided to do a bit of tandem fettling and Sheila and John stayed to help by watching. In a moment of further oversight, John forgot to tell Judy and Mary that the church on the skyline was not in fact the top, but that after a false flat the hill continued upwards. 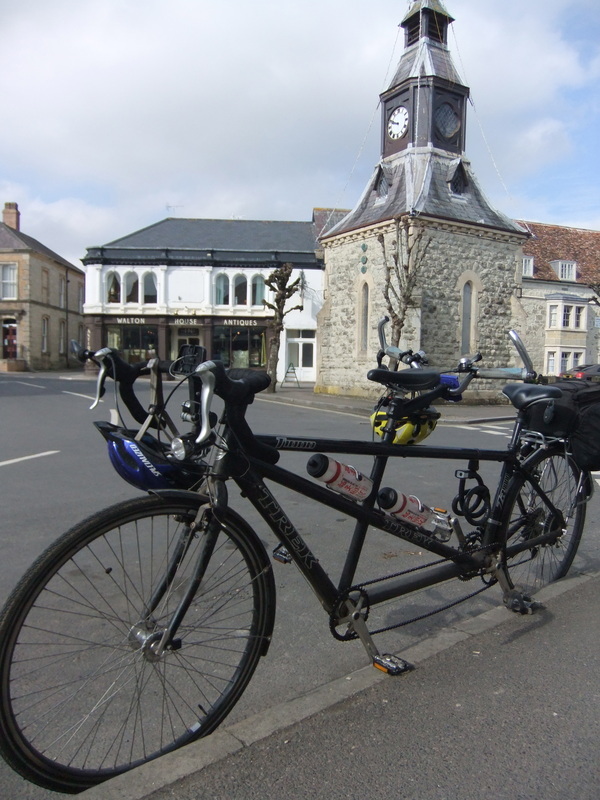 The tandem crews managed a few more excuses for not immediately setting off, but eventually could think of no more, so set off in low gears. In the meantime Judy and Mary at the summit, and not feeling inclined (should that be decline?) 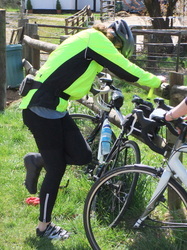 to descend to find out where the rest of the party had gone, took to flagging down motorists to ask if they had seen any cyclists. 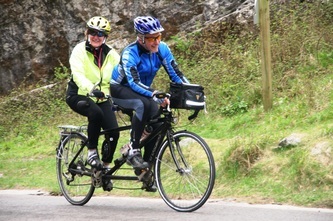 The best answer being, “No, just a tandem”. 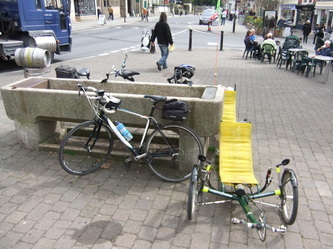 Re-united, everyone declared Gare Hill to be a real brute several categories more severe than Cheddar Gorge. 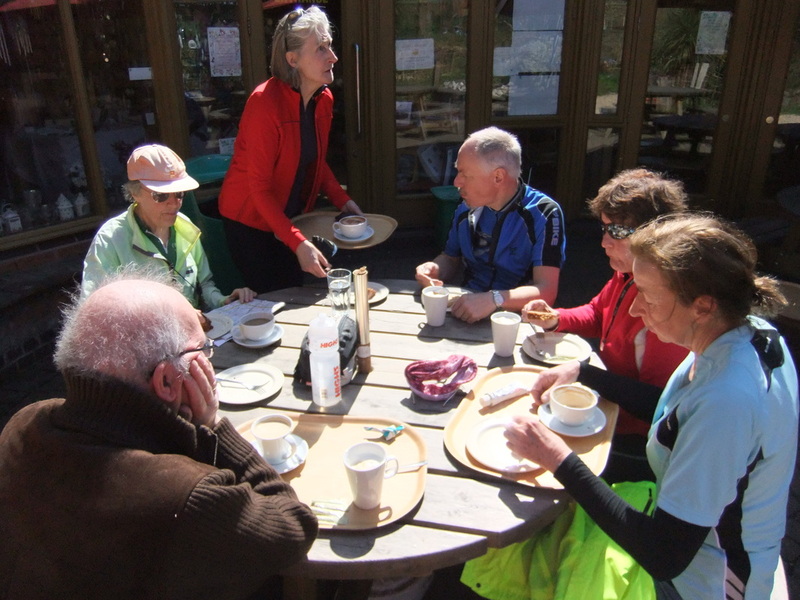 Payback time – there now followed a marvellous long steady never ending freewheel (but brakes not needed) run dropping down for mile after mile across Kilmington Common and around Stourhead in time to reach Mere for our afternoon tea stop at the Angel Tea Rooms. 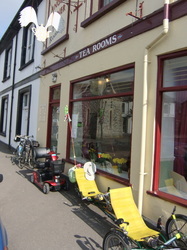 A first class teashop with teapots everywhere. Some naked and others dressed up in various fashions of tea cosy. 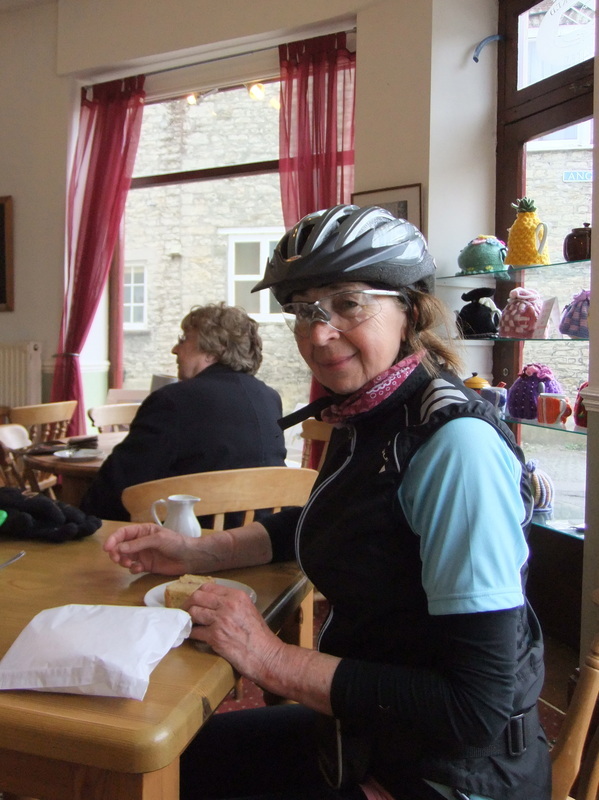 Sheila and Judy even managed more cake…. Afternoon sunshine and easy cycling across the River Lodden Valley brightened everyone’s spirits before the fourth and final hill climbing challenge of the day. 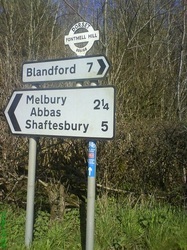 As is well known the altitude of Shaftesbury is considerable for an English town and nearly all ways into it are up. We battled up the hill to the top only to discover that this was the hill before the hill into Shaftesbury, which followed in a short distance. A last low gear effort took us to the top and into town where we were applauded by a small child for making it to the top after the final killer bend. Happily our B&Bs were nearby. Later we took a sight-seeing stroll around the town centre including a glimpse down Gold Hill for those not suffering vertigo before enjoying a good and lengthy dinner in an Italian restaurant housed in a former church. 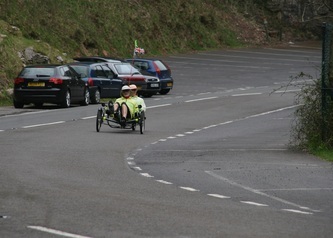 Small lanes around the Donheads to the A30. 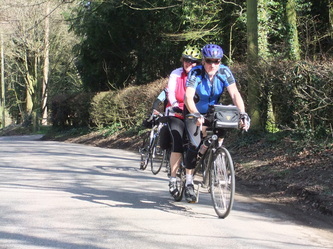 Then we follow the Ebble valley from Alvediston to Broadchalke before climbing over Martin Down and descending towards the Avon Valley Home territory in the New Forest through Fordingbridge, the Gorleys and over the Linwood Road to descend through Boldrewood and along the Ornamental Drive. 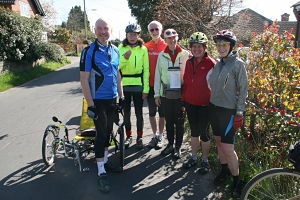 Friday morning, and overnight rain had given way to spring sunshine. 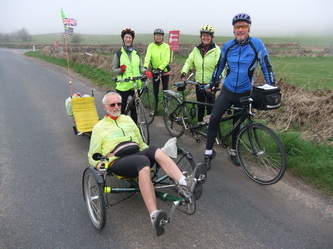 Our B&B host had been forced to give up driving because of eyesight problems and asked if he and his wife could have their photo taken on the Greenspeed trike. His intention being to send it to their daughter declaring that they had found an alternative to motorised transport. This was duly arranged and followed by assorted group photos. 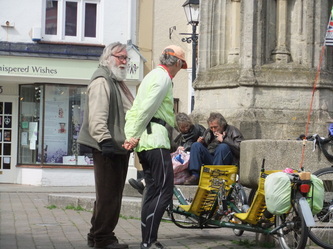 All ways into Shaftesbury being up, the morning good news (as well as another fine day) was that all ways out of Shaftesbury are down. 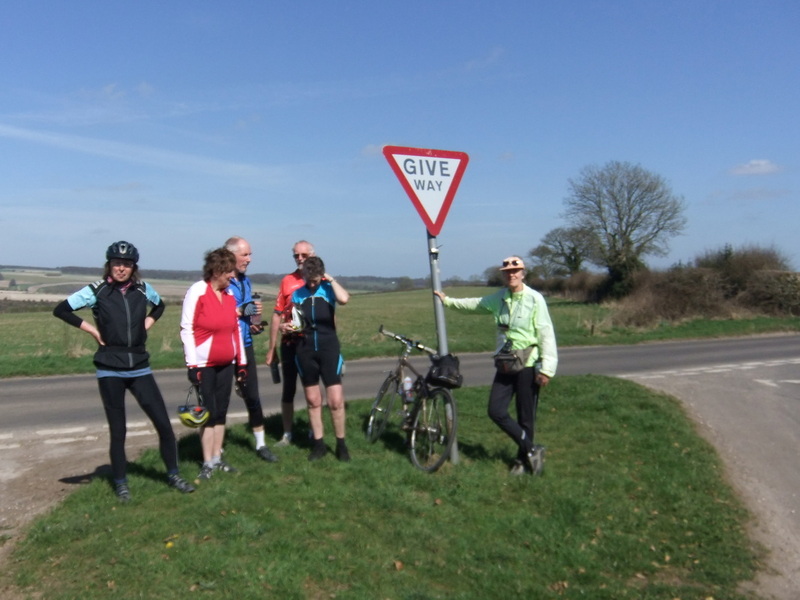 After just under a mile on a busy road we dived off and descended steeply down pretty lanes with views out to both sides across the countryside to reach Donhead St Mary. A short climb took us up through Berwick St John and down to the Ebble Valley. 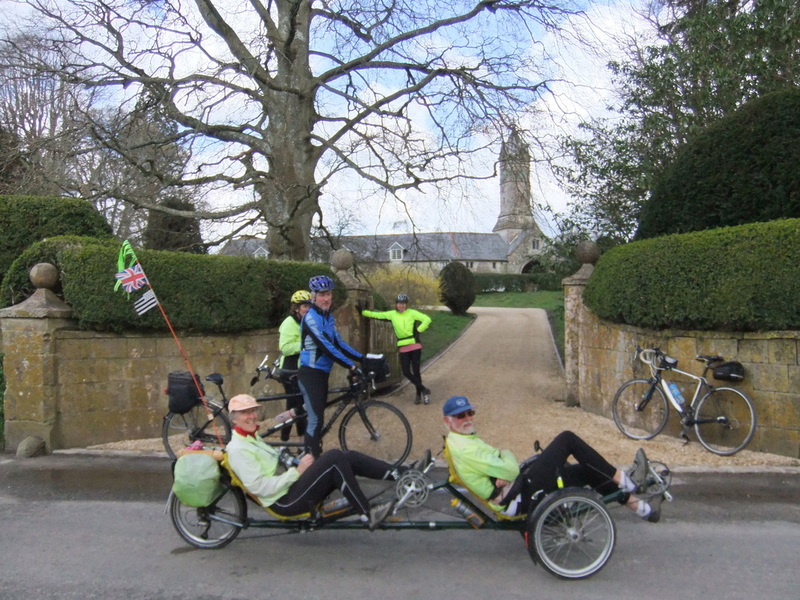 We pedalled through its pretty villages with the river valley on our right admiring the fine houses from a prosperous past (and probably present too for their current owners). 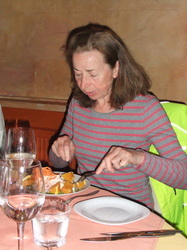 Judy made assessments of various properties to see how they measured up on her ownership aspiration scale. 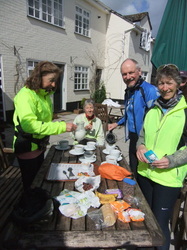 Almost spot on 11:00am we rolled into Broadchalke where the Queen’s Head provided coffee. This was taken in the yard at the rear and we escaped a brief shower under a shelter in the garden. 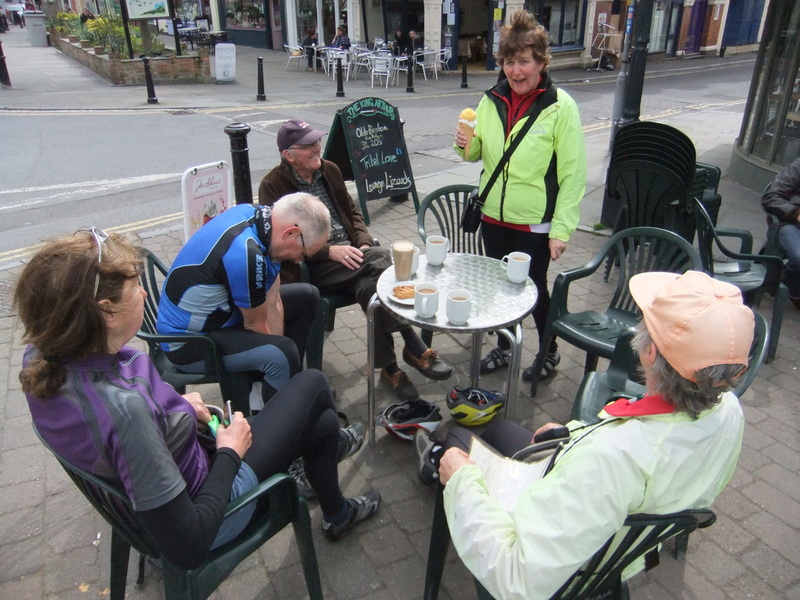 Final group photos were taken in front of the pub and we set off for the final biggish hill of the tour up and over Martin Down. 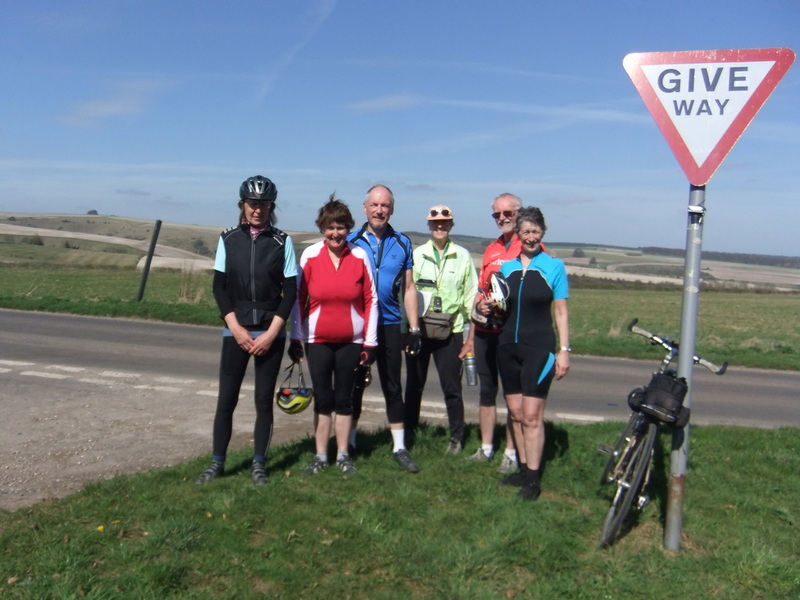 By now this was no great challenge to our hardened tourists and after a brief stop to admire the views out across the Downs we rushed down to cross the A354. Everyone enjoyed the gradual descent from there; and freewheeling or easy pedalling through Martin and Tidpit to Damerham was a welcome final day cashing in our previous altitude gains. 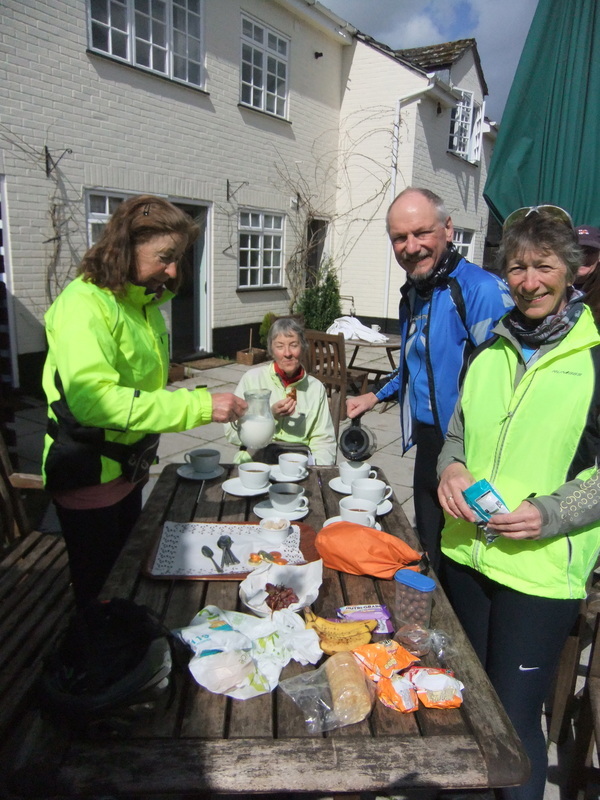 A short pull out of Damerham, over the bump in Ashford and in no time we were heading down the Avon Valley towards our lunch stop at ‘The Royal Oak’ at North Gorley. 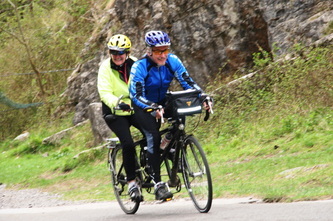 A cycling friend plus wife appeared by chance and joined us. Familiar roads and hills up the Linwood Road, through the dip under the A31 and through Boldrewood took us to the Ornamental Drive. 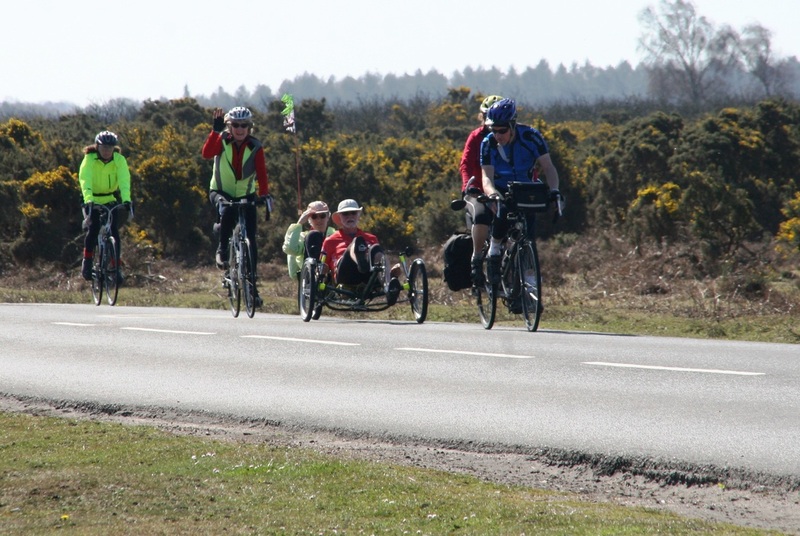 After four days of quiet lanes the Ornamental Drive seemed to be absurdly busy with traffic including a high proportion of pushy inconsiderate motorists – welcome home to the New Forest. We discovered later it was so busy due to diversions following the closure of the A337. Through Brockenhurst and a parting of our ways in the Sway Road concluded the tour, with Mike generously doing a bag drop at each of our houses. 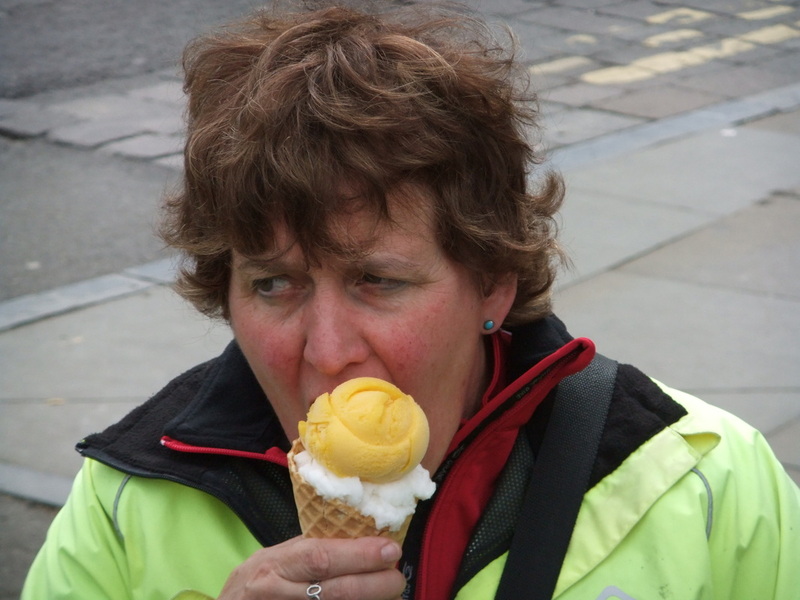 Editor’s note: All anatomical references have been removed from this diary to protect the innocent.